Obsidian's latest RPG out next Thursday. 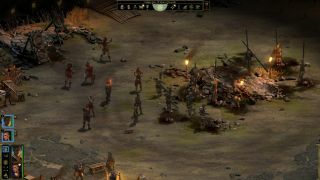 Tyranny, the RPG where you play as an agent for the bad guy, is out, blimey, next week, and if you have the time for a big ol' isometric RPG over the festive period, you'll be getting one with companion combo attacks and spellcrafting, as explained in a new trailer. I do love a good magic system, and the one in Tyranny seems particularly flashy and creative, giving you the ability to mix and match spell parts as you see fit. But enough talk: let's let the developers explain all that and holy hell, keep an eye out for a particularly hirsute beard. There's a lot of Pillars of Eternity in there, which makes sense, but there seems to be a bit more dynamism to the combat, including those vaguely Blizzard-ish companion combo moves. All in all, I'm looking forward to playing version 3.0 of this sometime in 2019; those of you with the time to play Tyranny at launch can get stuck in from November 10.